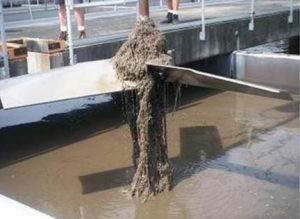 Home » Flexachem Reduce WWTP Downtime with the RL-3 Ragless Impeller. Reduce WWTP Downtime with the RL-3 Ragless Impeller today and reduce the cost of energy consumption, maintenance costs and motor replacement. The RL-3 Ragless impeller eliminates expensive maintenance and downtime caused by fibrous material build-up on an agitator’s impeller. The RL-3 Ragless Impeller with its Innovative Design ensures that Fibrous material does not wrap around the RL-3 Blades or Hub and then move up the Shaft. Below is an example of a HE-3 impeller with the build-up of fibrous material after 8 weeks operation. With its superior performance, the RL-3 Ragless impeller is specifically engineered to prevent fibrous material build-up as seen above.This is accomplished through several key product design features that eliminate any edges or protrusions that would allow build up on the impeller. This is accomplished through several key product design features that eliminate any edges or protrusions that would allow fibrous material to agglomerate. All these features combine to prevent build up and Reduce WWTP Downtime with the RL-3 Ragless Impeller. increase energy costs and even damage the agitator seals and gearbox causing costly repair. The RL-3 Ragless impeller prevents build up to eliminate maintenance costs and downtime, increase performance and extend the service life of the agitator. See the superior performance for yourself below. ← Does your Operation Suffer from Dry Running Seals?A solution for you.